In the winter, time seems to stand still. The growth of plants slows, animals are in hibernation, and you often get stuck at home because of the heavy snow outside. But, while it’s nice to stay inside the house for warmth, at some point you might have to consider venturing outside and cleaning your gutter. According to the Property Claims Services, the winter weather resulted in about $30 billion insured catastrophe losses from 1996 to 2015. That’s about $1.5 billion every year. from 1996 to 2015. That’s about $1.5 billion every year. 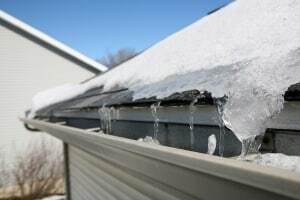 Whether your home is insured against winter weather or not, it’s better that you prevent the damages that winter can bring to your home, more specifically, to your gutters. Why Should You Clean Your Gutter This Winter? After your initial rain gutter installation, you may think that your gutters are good to go. Unfortunately, various forms of debris can get trapped inside them, in spite of gutter covers. For this reason alone, you need to check out and clean your rain gutters regularly. With winter weather in the mix, though, your gutters face much more strain. Debris like leaves and branches cover your roof and your gutters. When the snow falls, it traps the debris and clogs your gutters. The heavy buildup can rip your gutters right off the edges of your roof, thereby calling for expensive repairs. Prevent costly repairs or gutter replacements by having your gutters cleaned out, instead. This proactive measure is not only cheaper, but it will also save you the headache of having to get new gutters. Standing water in clogged gutters makes for a perfect breeding ground for pests. This attracts all sorts of pesky critters from bugs such as mosquitoes and wasps to bigger animals such as rats. Stop the formation and spread of disease from these disease-carrying creatures and clear your gutter of debris. With the cold weather, water that is trapped in your gutters eventually freezes. This creates a natural dam that prevents water from escaping your roof area and adds to the weight of an already clogged gutter. Along with the debris, this can cause further damage to the exterior of your home and roof. One of the main reasons you should install rain gutters in the first place is to stop rainwater or snowmelt from damaging your house. With gutters, you prevent the formation of water stains, cracks, and other water-induced damages on your exterior walls. When your gutter’s clogged, water can overflow and run down your exterior walls, causing damage to your paint job. Depending on the weather in your area, spring can bring heavy rainfall. If you neglect to clean your gutters by then, most of the problems mentioned above will be your recurring nightmare once spring comes. Your gutters will likely be damaged, thereby causing flooding in your property. Not only that, you’ll have to pay for costly repairs, too, depending on the severity of the damage. By cleaning your gutters this winter, you’ll have them fully functional when spring starts. So, you can enjoy the weather without having to worry about whether your gutters will collapse or if rainwater will damage your property. And if you don’t want to deal with this hassle again, give us a call at 877-594-7449 and we can install seamless gutters with Leaflock Gutter Protection.